In Charlottesville, Virginia, on the historic pedestrian mall, there once was a bookstore called Williams Corner. Its picture windows faced the cobblestone walkway, new books displayed behind the antique glass. When I was a starving graduate student in my early twenties, I went into the store twice a week, and walked past those windows nearly every day, on my way to my waitressing job a little farther down the mall. I took note of the new books published that week and which author would be reading soon. I was just starting to become a writer then, and this store was a haven on both dark days and good ones, the place I often went to feel less lonely. Many years later, after I’d moved to New York City, I got an unexpected phone call from Michael Williams, the owner of Williams Corner. He congratulated me on my first novel, The Fires, which was about to be published. I was elated to hear from him. When I’d pictured what it would be like to publish a book, one of the things I’d imagined was having my book displayed in the window of Williams Corner. Then Michael told me he’d had to close the bookstore. “I’m so sorry,” I stammered. It felt like a death. Williams Corner was not just “brick and mortar,” as opposed to “online.” It was the meeting point of a community; where I’d discovered books that had changed my life; where my writer-friends and I had been nurtured, early on, even before we’d published much of anything. A week later, I was driving down 95 with my cousin, the novelist, Darcey Steinke (who gave several readings at Williams Corner, the first from a draft of her novel, Up Through the Water; I remember she wore a black, glittery sweater, and the back room was packed). We drove straight through for ten hours that Saturday in order to make it to the party the next afternoon. It was a bit like driving to a wake. That tells you something about what Williams Corner meant to us. It turns out there were a few goodbye parties for Williams Corner, full of book lovers mourning the end of something. Part of what made Williams Corner such a great bookstore was its location on the mall, which is the length of a few blocks, a place that people walk through for the shops and restaurants, but also just to get from one part of town to another, so that books were casually integrated into the life along that strip. At Miller’s Restaurant, where Darcey and I worked, the wait staff were big readers, and among our fellow waiters was Dave Matthews, just after he’d moved to this country, before he’d become a famous musician. We’d talk about books during the down times, and before or after our shifts, we’d head to Williams Corner to find the book someone had recommended to us. Michael Williams was a great conversationalist, and his intelligence colored the character of the store and its offerings. It’s a testament to the quality of his taste that, through numerous purges and cross-country moves, I still own, and return to, most of the books I discovered on the shelves of that bookstore—among them, Jeanette Winterson’s Oranges Are Not the Only Fruit, Italo Calvino’s Invisible Cities, Robert Walser’s Selected Stories, William Goyen’s Had I a Hundred Mouths, William Gass’s On Being Blue, and Joy Williams’ story collection, Taking Care. I also bought all of the collections of poems by Charles Wright and Gregory Orr, who were then my teachers, fiction by George Garrett and John Casey, also teachers, and the plays of Sam Shepard, who lived nearby. There was a special thrill to reading the Shepard plays, knowing that I might be standing next to him in the poetry section of Williams Corner, as I did one afternoon, as he perused a book by Baudelaire, and I pretended not to notice. His work moved me particularly because I’d grown up in Texas, and I felt he understood something unusually well about the Southwest, cowboy culture, the character of people I’d known growing up. Although I was always too shy to say anything to him, his presence around the bookstore made the literary life seem less impossible somehow, more vital than it felt in my dismal basement apartment, where I sat at my desk made out of an old door. I also sometimes saw my mentor, Charles Wright, in the stacks, always courtly and friendly. There was a time when he gave a reading at Williams Corner that was so crowded I had to sit on the floor, pressed against one of the shelves in the fiction section. At the university, he was my professor, but after that reading, having witnessed how his poetry held a hundred people rapt, I saw him differently. My close friend worked at the store for a period of time. She was a published poet, had once been an editor at Publisher’s Weekly, and was one of the most well read people I knew. Who better to suggest what to read next? Michael only hired people who knew literature, and that meant you often found the books you wanted, along with a few others you didn’t know were essential until that very moment. From my paltry earnings, I used to save up to buy the books I’d been eyeing and hoped they wouldn’t sell out before I got the money together. The weekly readings at Williams Corner were like parties, with wine and cheese, the room a mix of young, unpublished writers, avid readers, and charismatic local writers like Peter Taylor or Ann Beattie. I went to a reading there nearly every week. I still miss Williams Corner. When the store closed, frankly, I was afraid for all of the independent bookstores. If a bookstore as magnificent as Williams Corner could shut its doors, what would happen to the rest of them? I’m happy to say that, in Brooklyn, where I live now, there are at least six independent bookstores, some of them new, and they all seem to be thriving, with communities more disparate but no less lively than the one that gathered at Williams Corner. And because I don’t want any of them to close, I buy my books at these places. Frankly, these stores give me hope for the future of books. “Have you read this novel?” said the man wrapping the book. Rene Steinke’s most recent novel is Friendswood (Riverhead), which NPR named one of the Best Books of 2014. 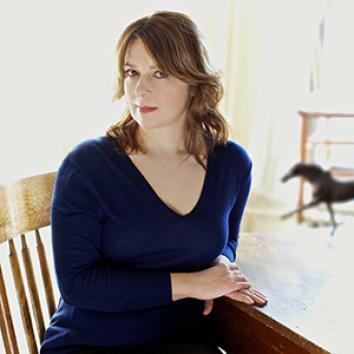 She is the author of Holy Skirts (a National Book Award Finalist) and The Fires. Her articles and essays have appeared in The New York Times, Vogue, O Magazine, Bookforum, and Triquarterly. She is the Director of the MFA Program at Fairleigh Dickinson University, and Editor-at-Large at The Literary Review. She lives in Brooklyn. You can find her on Twitter @renesteinke1. I adored this post. Thank you for sharing it. Glad you liked it, Lydia. I know Rene will be pleased.